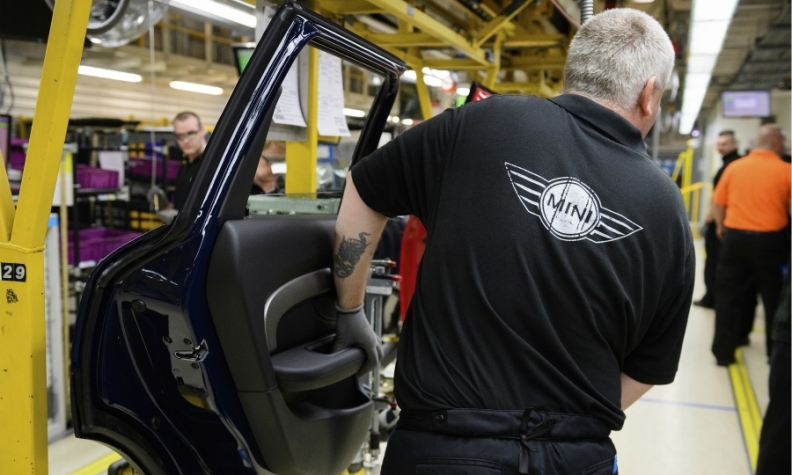 BMW builds its Mini brand in Oxford, England. FRANKFURT -- BMW has strengthened its logistics to include air freight options as part of contingency plans to prepare itself for Britain's exit from the European Union. "We have also taken measures to secure supply routes by air," CEO Harald Krueger said on Wednesday in response to a question about the automaker's contingency plans to help ensure a smooth supply of components while politicians haggle over the terms of Britain's exit from the EU. BMW hopes that Britain will remain part of the single market, but the automaker is making plans to prepare for a possible "hard Brexit," Krueger said on a conference call to discuss the company's third-quarter earnings. BMW currently builds most of its Mini vehicles at a plant in Oxford, southern England, but relies heavily on components imported from BMW's German plants. Oxford made about 60 percent of the 378,486 Minis produced by BMW Group last year.